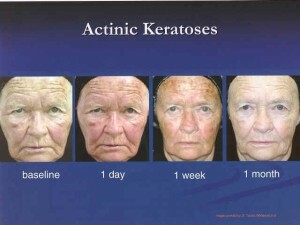 Actinic keratoses are considered the earliest stage of skin cancer. They are often referred to as pre-cancers. 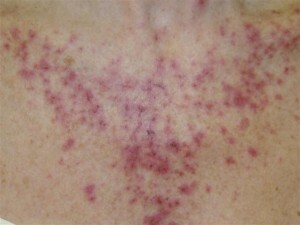 They commonly appear on areas of the body that have been exposed to the sun. The face, ears, forearms, hands, and chest are some of the most common areas one will find Actinic keratoses. They appear as small scaly spots often with a red base. There are several recommended treatment methods for Actinic keratoses. Such methods include but are not limited too, cryotherapy (freezing with liquid nitrogen), photodynamic therapy, and topical prescription creams. 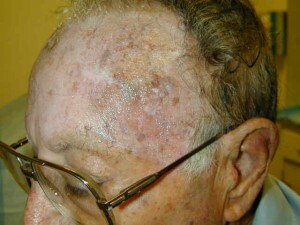 Some Actinic keratoses may require more extensive treatment. The use of sunscreen can help prevent Actinic keratoses. Photodynamic Therapy (PDT) is a special medical treatment that uses a photosensitizing drug and a light source to activate the applied drug. This treatment is offered at The Skin Center at Laguna where over 500 patients have been successfully treated since 2004. The result is an activated oxygen molecule that can destroy specific cells, including pre-cancerous or certain types of cancer cells. The procedure is generally minor and performed in a physician’s office or outpatient setting. PDT essentially has three steps. First, a light sensitizing liquid, cream, or intravenous drug (photosensitizer) is applied or administered. Second, there is an incubation period of minutes to days. Finally, the target tissue is then exposed to a specific wavelength of light which then helps activate the photosensitizing medication. Although first discovered around 1913, PDT in the modern sense is a fairly new, evolving science whereby varying incubation times of a light sensitizing drug are used in combination with varying types of available light sources depending on the target tissue. The basic premise of PDT is selective tissue destruction. Although the photosensitizer may be absorbed all over by many cells, atypical or cancerous cells preferentially take up more of the drug and also may retain the drug for longer duration than normal tissues. At present, the primary limitation of available PDT techniques is the depth of penetration of the light and ability to target cells within at most 1/3 of an inch ( approximately 1cm) of the light source. Therefore tumors or atypical growths must be fairly close to the skin or treatment surface for PDT to work. PDT is currently used in multiple medical fields including oncology (cancer), dermatology (skin), and cosmetic surgery. In oncology, it is FDA approved for non-small cell lung cancer, esophageal cancer, and pre-cancerous changes of Barrett’s esophagus. Its use is also being further investigated through clinical trials in general oncology for conditions including cancers of the cervix (mouth of uterus), prostate gland, brain, and peritoneal cavity (the abdominal space that contains the stomach, liver, and internal organs). 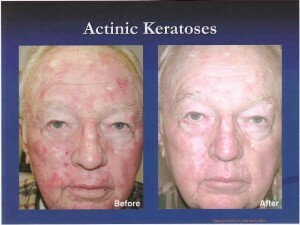 In dermatology, PDT using Levulan Kerastick® (20% delta-aminolevulinic acid HCl) became FDA approved in 2001 for the treatment of pre-skin cancers called actinic keratosis (AK). The initial approval was specifically for normal (non-hyperkeratotic) actinic keratosis of the face and scalp with a specified 14 to 18 hour drug incubation time, and 1,000 seconds (16 minutes and 40 seconds) of activation by a proprietary blue light source. Since 2001, PDT has also received many other non-FDA approved ( also called “off-label” ) uses including acne, rosacea, skin cancer, sun damage, cosmetic skin improvement, oily skin, enlarged sebaceous glands, wrinkles, rejuvenation (anti-aging), warts, hidradenitis suppurativa, psoriasis, and many other skin conditions. At least 3 currently FDA approved photosensitizers are available including Photofrin (porfimer sodium), Levulan ( 5-aminolevulinic acid or ALA ), Metvix (methyl aminolevulinate (MAOP)) . More drugs are undergoing trials and may become available in the near future. Photofrin is used intravenously ( IV)for internal cancers while Levulan and Metvix are applied topically for skin therapy. What light sources are available? PDT can essentially use many types of light sources. These include laser, intense pulsed light, light-emitting diodes (LEDs) , blue light, red light, many other visible lights, including natural sunlight. Photosensitizer drugs may become activated by one or several types of applied light depending on the ideal wavelength for the particular drug used and target tissue. How is the light applied? The light source needs to be directly applied to the target tissue for a specific amount of time. For surface skin treatments, the light is easily directly applied to the area of the skin where the photosensitizer drug has been applied ( such as face, scalp, arms, etc.). For internal cancers, delivering the light to the desired area is more challenging. The light may be delivered through small fiber optic cables into the body cavity or area being treated. Sometimes endoscopes ( a thin lighted elongated tube which is inserted into a body space) are used to deliver the light into the lungs, stomach, or bladder. PDT works by direct injury to the target cells and tissues. While all of the exact mechanisms are not fully known yet, the basic pathway seems to involve an activated oxygen molecule that has the ability to injure or destroy nearby or specific cells. Aminolevulinic acid is then incorporated into the body’s natural heme ( blood) biosynthesis pathway and activated to form protoporphyrin IX, a potent photosensitier. Protoporphyrin IX then becomes excited to an activated singlet state. This active singlet state is then directly toxic to cells. Other potential pathways include directly killing abnormal or cancerous cells, damaging the blood vessels and blood supply to the tissue, causing inflammation and irritation, and possibly also activating the person’s own immune system to attack the abnormal or cancerous cells. Does PDT make me permanently more sensitive to light? No, PDT causes a temporary sensitivity to light, including natural sunlight and some indoor lights. The light sensitivity resolves with time depending on both the photosensitizer drug and dosage used. How long do I have to stay out of the sun and light? Light avoidance is generally required after PDT. The duration depends on the drug and dosage used. Intravenously given Porfimer may make the body including the skin and eyes sensitive to light for about 6 weeks after treatment. Proper protection including long sleeves and sunglasses may be required. Topically applied aminolevulinic acid (Levulan) or methyl aminolevulinate (Metvix) may cause skin sensitivity only on the treatment areas for approximately 24-72 hours. These do not usually cause sensitivity on other body parts other than where the drug was directly applied. Your physician will need to discuss with you the required sun and light avoidance period required after your particular treatment. How is PDT used to treat the skin? PDT using Levulan ( 5-aminolevulinic acid or ALA ) and a proprietary Blue light is currently FDA approved for the treatment of skin pre-cancers called actinic keratosis ( rough scaly spots generally on sun exposed skin in more fair skin individuals). PDT is also known as “ALA/PDT treatment” or “Super Blue Light”. It has been referred to as a “super photo facial” when the photosensitizer is used with a machine called intense pulsed light or IPL. These treatments may help remove sun damaged pre-cancerous zones and spots. Sun damage, fine lines, and blotchy pigmentation may also be improved because of the positive effect of PDT. IN some patients, PDT also has been shown to help decrease the appearance of pores and reduce oil glands, effectively treating some subtypes of patients with stubborn acne, rosacea, and help improve the appearance of some small superficial acne scars. Although PDT’s use in skin was first investigated in 1990’s for actinic keratosis, it was not as popular or widely used because of the required long incubation times (usually 18-24 hours) and limited indications. Since approximately 2001, PDT has become more widespread in use primarily because of advances including shorter incubation times (30-60 minutes) and more applications including acne and cosmetic skin rejuvenation. What is a photosensitizer drug? Photo sensitizers are chemical compounds that become activated only when exposed to light. What is Aminolevulinic acid or Levulan? 5-aminolevulinic acid also called Levulan or ALA for short is a naturally occurring protein in the body. It is found in small quantities as part of the normal heme ( blood) synthesis pathway. In larger quantities, it is a substance known to increase sensitivity to certain wavelengths of light. By preferentially attacking the active or abnormal cells, PDT combines a very high success rate with good preservation of normal skin without significant risks for scarring. Once the areas have healed following PDT, the areas are re- examined to see if additional treatments or possible biopsies are needed. PDT is special because it is a targeted treatment to preferentially target more rapidly dividing cells and atypical skin growths. With regular or traditional cryosurgery ( freezing with liquid nitrogen) or burning, only the visible pre skin cancers are treated thereby leaving ones that aren’t as apparent ( sub clinical or hidden) lesions undetected. Photodynamic Therapy allows for field or blanket treatment of an entire area of sun damage thereby reducing the chance that undetected pre skin cancer cells will be left untreated. Photodynamic Therapy is usually scheduled in the doctor’s office because of the required photosensitizing prescription / physician applied medication and the special light activation equipments. Currently PDT procedures are generally performed with the patient waiting in the office during the 30 minute to several hours incubation time before the application of the light source. What is a typical skin PDT session like? You may be given a written procedure consent form to read and sign before your first treatment. The medical staff may take some before photography prior to applying the photosensitizer medication. In the treatment room, you may be sitting or comfortably lying back on a table. This part is generally painless and comfortable. Often a thorough cleansing of the face is done using alcohol and or acetone to degrease the skin. The less oil on the skin, the more readily the skin will absorb the applied topical medication. In some patients microdermabrasion may additionally be performed prior to the application of the medication to further prepare the skin to optimally absorb the photosensitizer. The photosensitizer liquid or cream is applied topically to the whole area being treated (such as the entire face, scalp, back of the hands, back part of the forearms, legs, feet, scalp, chest, or back). The medication is allowed to air dry for a few minutes and then you will wait anywhere from 30-60 minutes for the incubation time. Some areas such as chest, back and particularly forearms and legs require longer incubation times of 2-18 hours for better results. No two people or skin on different areas of the body are exactly alike. PDT requires physician adjustments for specific individualized incubation times and treatment durations. After the proper incubation time, you are brought back into the light source room where the medication is activated with a specific wavelength light source. There may be sensations of warmth, tingling, heat, or burning in some patients. 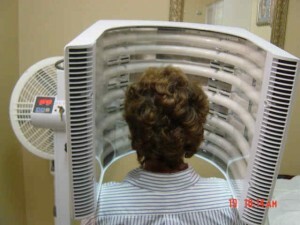 Frequently, you will have a fan to help cool off during the treatment. The treatment area is then washed off and sunscreen applied before leaving the office. Instructions and an appointment for follow up may then be given on how to care for the improved skin. •How much improvement can I expect? No two individuals are the same and results may vary. As with any medical procedure, some conditions can improve dramatically in some patients and not respond in others. Overall, patients with severe sun damaged skin manifested by actinic keratosis, texture, and tone changes including mottled pigmentation, dull or sallow skin, and skin laxity may see good to excellent improvement with PDT. There have been reports of possible improvement of large pores, non- pitted acne scars, and active acne. •Depending on the area being treated and the recommended incubation time, different numbers of treatment sessions spaced 4-6 weeks apart may be required to achieve the desired improvement and reduction in lesions. It is not always possible to predict ahead of time how many treatments your specific condition may take or how you will respond to PDT. Photodynamic Therapy requires your patience and your willingness to follow the post procedure instructions, including staying out of the sun for 24-28 hours depending on the area treated and your physician’s requirements. •How many treatments will it take to see the best results? To achieve maximum improvement of pre-cancerous (actinic keratosis) sun damage, skin tone and texture, on average a series of 2-3 treatments 2-6 weeks apart may be quite effective. Some patients with milder actinic keratosis are happy with one treatment. More treatments can be done at periodic intervals in the future to maintain the rejuvenated appearance of the skin. •Where can I have Photodynamic Therapy? Photodynamic Therapy for skin therapy is usually comfortably performed in an outpatient setting like a doctor’s office and without any sedation or anesthesia. The Skin Center offers this treatment in South Orange County, Laguna, Mission Viejo, and the surrounding areas. You may check the www.AAD.org for board certified dermatologist members of the American Board of Dermatology in your area or www.ASPDT.org for members of the American Society of Photodynamic Therapy. While these photosensitizer medications may currently only be available to medical personnel, it may be foreseeable or possible in the distant future where patients could be given a prescription for the topical or oral photosensitizer and a light source for physician directed home use. How long does a skin PDT procedure take? You are generally in the medical office for several hours( average 1 1/2 hours) on the day of your Photodynamic Therapy. Facial PDT may take 10 minutes to apply the medication, 30-60 minutes to allow proper skin incubation, and 15-20 minutes for light application. Other areas may require longer incubation times and you may leave the office and come back when it is time to have the light. Many patients prefer to schedule their treatment later in the afternoon so they may go directly home after the treatment. It is not usually advised to have any sun exposure such as from running errands or driving around after the treatment. What kind of physician can perform Photodynamic Therapy? Most skin PDT is performed only by specially trained dermatologists and their medical staff. Other physicians including oncologists, family physicians, internal medicine doctors, plastic surgeons, or Ear, Nose and Throat ( ENT) surgeons and their medical staff who are trained and may also perform Photodynamic Therapy. •Where can I find a doctor board certified in Photodynamic Therapy? The Skin Center is a member of the national organization called the American Society for Photodynamic Therapy (ASPDT). You may check the website for members of this group at http://www.aspdt.org. There are many other photomedicine interest groups and societies dedicated to this evolving field. Some dermatologists and oncologists have received special residency or post graduate training for photodynamic therapy. Many other physicians may be trained by companies that manufacturer the photosensitizing material and /or the light source. •Is skin PDT only for pre-cancerous growths? No, Photodynamic Therapy is a widely used method of treating many conditions including pre-cancers (actinic keratosis), some types of superficial skin cancers, acne, rosacea, warts, sebaceous hyperplasia ( enlarged oil glands), fine wrinkles, psoriasis, and other cosmetic indications. It is currently not used to remove malignant melanoma or deeply invasive cancers. It is not used to remove moles or birthmarks. Less frequently, Photodynamic Therapy may also be used “off-label” for other less common conditions including hidradenitis suppurativa, porokeratosis, disseminated actinic porokeratosis (DSAP), and other investigational conditions. What are the advantages with Photodynamic Therapy for treating skin pre-cancers? The greatest advantage of PDT is the ability to selectively treat an entire area of skin damage and pre-cancers (blanket or field treatment). PDT generally decreases the likelihood of lighter or darker skin spots ( post-inflammatory hyper or hypo pigmentation) caused by routine freezing with liquid nitrogen. Additionally, PDT frequently may facilitate smoother skin and an overall improved appearance, tone, color, and enhanced skin texture. In several studies, PDT has been preferred by many patients for ease of use and recovery as compared to alternative treatments including freezing and chemotherapy creams like fluorouracil (Efudex). The PDT side effects may be milder with less down time than with fluorouracil. For patients with many skin lesions, PDT may be generally more effective than repeated spot treatment with topical liquid nitrogen. Some patients are unable to tolerate the prolonged treatment required with fluorouracil (Efudex) or imiquimod (Aldara) because of the irritation, redness, and possible downtime with these topical creams. PDT has become a very well tolerated, essentially painless, non-invasive (no needles or surgery required) procedure to help reduce sun damage and enhance the overall cosmetic outcome (particularly in sensitive areas of the face and chest). How many treatments of Photodynamic Therapy will I need? No two people’s skin is exactly the same and therefore individual results and number of required treatments vary. On average, most patients may benefit from 1 to 3 PDT treatments for an area and annual touch up treatments. While the face tends to respond faster and to fewer treatments, areas like the forearms and legs are much harder ( resistant and tough skin) to treat and may require many more treatments. There is no way to reliably predict ahead of time exactly how many treatments your condition will require. Photodynamic Therapy physicians always strive to treat your condition in as few treatments as possible without causing a severe burn. •Can I go out in the sun right after PDT? No. There are very specific strict sun restrictions for the treated area after Photodynamic Therapy. You may not go out in the sun even with sunscreen for usually 24-48 hours after PDT especially after facial treatment. Arms, legs, chest or back PDT may be much easier since you can wear high SPF protective clothing and sunscreen to protect the areas during the post-procedure period.. It is important to follow your own physician’s instructions for wound care and sun protection. •Can I remove my moles or birthmarks using Photodynamic Therapy? No, at present Photodynamic Therapy is usually not for mole removal. Moles are usually removed by standard or traditional surgery. Am I a good candidate for Photodynamic Therapy? The best candidates for PDT may be those with lighter or fair skin with sun damage. You may not be a good candidate for Photodynamic Therapy if you have darker skin that tends to turn brown or discolor with certain light or laser treatments. You may also not be a good candidate for PDT if you are very sensitive to light, burn extremely easily, would be unable to stay out of sunlight for the required 24-48 hours, or on taking medications which may make you very sensitive to sunlight or light based therapies. Your decision on the best treatment choice may depend on different factors such as the location and type of skin lesions, your past treatments, your overall health, and level of comfort. Your physician can help you sort through the different treatments and assist in your shared decision making process. However, the right decision for you is always yours and your doctor’s to make. Generally, there is not much of a problem with other health issues and PDT is safely performed in many thousands of people annually worldwide. Your Photodynamic Therapy physician needs to know of any other medical conditions that may affect your procedure or overall wound healing. You would want to make sure to tell your physician beforehand if you have any extreme sensitivity to light based treatments, take medications which make you very sensitive to light, have had a problem or bad effect from prior PDT, have lupus, or suffer from a condition called porphyria. Your Photodynamic Therapy physician needs to know if you have had a history of “Staph” or other skin infections in the recent past. You will want to advise your physician if you have a history of frequent cold sores ( Herpes virus infections on your face). In that case, you may be prescribed an antiviral tablet (cold sore prevention pill) to take before and after your procedure. You may be asked to wash with a special antibiotic soap or wash like Hibiclens ( Chlorhexidine) the night or morning before your procedure to help reduce the number of bacteria on your skin. Patients may need to also advise their physician of any drug allergies such as to topical anesthetics or other photosensitizers. Additionally, the surgeon may need to know of any bleeding or bruising tendencies, Hepatitis, HIV/ AIDS, or pregnancy. What areas are treatable by Photodynamic Therapy? Essentially any area of the body may be treated by PDT. 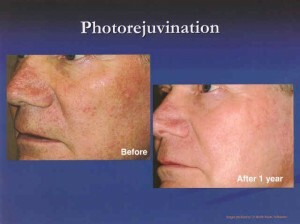 Photodynamic Therapy is used primarily for the treatment of head and face pre cancers and acne. It is particularly useful for areas with a large number of pre-skin cancers in difficult areas such as the face. It is also used on hands, feet, forearms, chest, back, legs and anywhere where there are AK’s. However, some of those areas may not be as responsive and may require longer incubation and or light treatment times for effectiveness. What growths is PDT not good for? Photodynamic Therapy is not as effective for thick skin pre-cancers called hypertrophic actinic keratosis (HAK). This may be due to the inability of the photosensitizer drug to penetrate the thick skin. These growths may need to be frozen or surgically removed or thinned using a curette prior to PDT. PDT may also not be very useful for more advanced skin cancers like morpheaform or sclerosing basal cell carcinoma, moderately to poorly differentiated squamous cell carcinomas, recurrent tumors (tumors that were previously removed and have re-grown at the same site, or lesions in previously radiated ( x-ray or radiation treatments)sites, and malignant melanoma. What are possible complications of Photodynamic Therapy? As with any surgery or procedure, Photodynamic Therapy is associated with some possible minor risks and complications. While it is overall a very safe and effective minor in office treatment, there are some possible uncommon complications. Since an exaggerated light sensitive reaction is expected by definition of PDT, most patients understand and expect some type of a sunburn or red reaction after skin PDT. Not everyone gets a sunburn reaction and in fact some patients may have no visible reaction or redness. 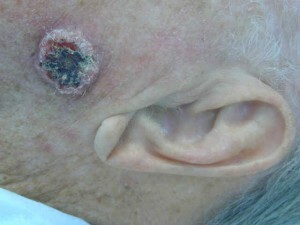 Possible risks and complications of Photodynamic Therapy include (but are not limited to) burning, skin discoloration, skin redness, broken blood vessels called telangeictasia, pain, infection, cold sore ( Herpes) activation, blisters, scabs, unsightly scar, keloid ( raised, thick scar), cosmetic disfigurement, skin discoloration, eye injury or swelling, allergic reactions, reaction to topical anesthesia, pre-cancer or cancer recurrence, need for further treatment including biopsy, radiation or plastic surgery, and rarely death. 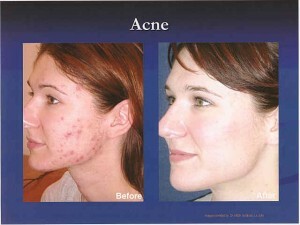 Acne may need additional treatments and may not respond at all or sustain a long lasting response to the treatment. Minor, serious, or life threatening reactions can occur with the use of anesthetics or with medications given before, after or during a procedure. Overall, most patients tolerate the minor procedure very well without any complications. Shared decision making is very important in your treatment and you are involved in how you prefer to treat your condition. Your Photodynamic Therapy physician may make some recommendations on how to proceed with further treatments.. The main goal with Photodynamic Therapy is to reduce the number of pre- skin caners and thereby potentially decrease the chance of future skin cancers. •Is there scarring from Photodynamic Therapy? No, PDT usually does not leave scars in typical cases. Overall when you undergo PDT, there will be some type of a red skin reaction and irritation for 3-10 days after the treatment. 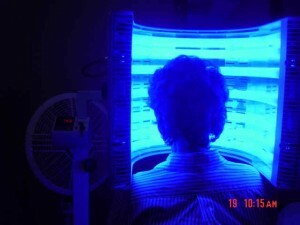 Some people are more sensitive to PDT and the light treatment than others. Similarly, some people heal better or faster than others. Some residual redness may be more noticeable depending on the location and skin type. Some people may have temporary skin discoloration that may last weeks to months. Patients with darker skin types may have more skin discoloration after treatment. •What are alternatives for Photodynamic Therapy? It is important to understand that as with any medical treatment, there are alternative treatments and options to PDT. You may want to discuss alternative treatment options with your doctor at your consultation appointment. 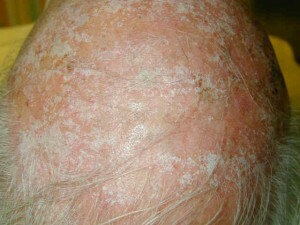 There are many options for treatment of actinic keratosis ( AK’s) including but not limited to freezing ( cryotherapy or cryosurgery), burning, chemical peels, lasers, chemotherapy creams like fluorouracil or Efudex, immune modulator creams like Aldara ( Imiquimod), local radiation , plastic surgery, curettage and desiccation (scrape and burn), surgical removal, no treatment, and other choices depending on the skin condition. In acne, there are many alternatives to PDT including oral Accutane ( isotretinoin), oral antibiotics, topical washes, acne facials, and many acne creams. •What about insurance coverage and costs? Photodynamic Therapy is currently considered a medical service for the treatment of some conditions particularly for skin pre-cancers called AK’s. However, it may be considered cosmetic, off’ label, or not medically indicated for many other conditions for which it is regularly used. Currently, some insurance plans cover the procedure under their provided benefits. However, with the many changes in insurance plans, it is always advisable to contact your insurance carrier prior to scheduling any treatment and confirm your eligibility and benefits. Photodynamic Therapy, like any procedure, will result in additional procedure charges above the routine office visit fees. These fees may range from two to several hundred dollars depending on the area, number of treatments, and the type of insurance you purchase. The more number of treatments and greater the amount of photosensitizer medication required, the higher the cost. Insurance benefits vary and reimbursement depends on what benefits you have contracted for with your company. Currently, Medicare generally typically covers 80% of Photodynamic Therapy for pre cancers. If you have a secondary insurance plan, that may help take care of the remainder 20% not covered by Medicare. Standard commercial or non-Medicare insurances currently generally may cover a large percentage of PDT for pre-cancers unless you have to meet an out of pocket deductible first. You may want to get to know and understand your insurance benefits before having surgery. In many cases, you may also ask the billing office at the medical center or your insurance coordinator for an approximate estimate of your charges before scheduling the procedure. •What about other treatments options? You may decide to have alternative treatments instead of PDT. Alternatively, you may also choose a hybrid option where you have Photodynamic Therapy and additional other treatments. In some cases, the most effective treatment for certain conditions may utilize a combination treatment using two or more modalities to help team up and treat the condition. •How do I prepare for my procedure? Your personal physician and their medical personnel will likely let you know the pre-operative instructions specific for your condition. For many typical PDT in a physician’s office, most patients are advised come in with a clean, washed area without any lotions or makeup. You may generally eat your regular diet on the day of their procedure and take all of your regular daily medications. Your skin should be fully clean and free of all make-up, moisturizers, and sunscreens. Bring a wide brimmed hat (6 inches), sunglasses, and scarf when appropriate to the appointment. Patients are advised to wear comfortable casual clothes and bring a wide brim hat for facial or scalp treatments. You should bring gloves or a long sleeve shirt if having hands or forearms treated. In nearly all cases, patients are usually able to drive after most procedures and do not necessarily need a driver unless they feel uncomfortable or have taken any sedative medications. Since you will be in the office for generally at least one hour (and sometime more), you may want to bring some personal snacks, drinks, and reading or knitting material. Personal music headsets or Ipods may also provide relaxation and help pass time during your PDT application, incubation time, and treatment. Most patients continue all doctor prescribed medications including aspirin and any blood thinners unless specifically advised otherwise only by the PDT physician. Can I smoke and drink alcohol before PDT? While there is no absolute contraindication, smoking may be discouraged for at least a few days before and 1-2 weeks after your procedure. As with any procedure, smoking can slow down wound healing and cause an increased risk of wound infections. Heavy alcohol use is not advised at least a few days before PDT. Heavy alcohol use can cause more bleeding and thin your blood. An occasional glass of wine or small cocktail may not cause severe bleeding. Your physician will want to know of any factors that may affect your surgery or wound healing. Recovery is usually fairly easy and uneventful for 90% or more of patients. Many patients have mild dryness and a faint to mild sunburn of the treated area. A small percent of patients may have moderate or marked discomfort and a harder recovery because of more skin dryness, redness, or burning. Some of these patients have had inadvertent sun exposure even as short as a minute or two during their immediate post treatment time casing a more severe reaction. A handful of patients have reported some minor sun exposing activities like briefly stepping out to fill their yard bird feeder or walk out for a moment to grab the mail from the mailbox. You will want to plan to stay indoors and avoid any sunlight for 24-48 hours as directed by your physician. Overall, you may be able to resume all normal indoor activities the first day. Most patients may resume going outdoor with proper sun protection including sunscreen and hat or cover up clothing 24-48 hours after this treatment. Again, it is always advised to check your personal physician’s guide for this care. Most patients are able to return to work or school the 24-48 hours after Photodynamic Therapy. Avoiding direct sunlight for the first 1-2 days in crucial to avoiding getting an exuberant (red) response. Your physician will need to let you know what activity precautions are required based on the area and size of your procedure. Your skin may appear very red causing you to need to explain that you either had a PDT treatment or perhaps just say you went skiing all day and forgot to wear sunscreen. Is there pain after PDT? Usually not much. No two individuals and their skin is exactly the same and therefore individual reactions and tolerance to discomfort levels vary. Most patient report mild skin irritation including minimal to mild dryness and tight feeling of their skin after PDT. This discomfort is usually improved with frequent application of bland topical emollients or plain Vaseline. A small number of patients may actually complain that they felt nothing and didn’t have any pain or peeling. Less commonly, a small percentage of patients for various reasons may have significant pain, a very exaggerated sunburn response, moderate overall discomfort, and pain from the tightness and warmth of the skin. If there is pain, many patients find that they prefer to take something for pain at the first hint of discomfort instead of waiting until the pain builds up to an unbearable level. If you have mild or moderate pain, your doctor may advise you to take Tylenol (Acetaminophen) or another pain reliever over the counter. Rarely, prescription pain medications may be required for severe pain. How do I take care of my treatment area after Photodynamic Therapy? It is generally required to check with your doctor for their specific wound care instructions before your procedure. Often, you will be asked to go home and stay indoors for the rest of the day, “couch potato day”. Your physician will usually give you more detailed instructions depending on the area and size of the procedure. Many physicians suggest you shower and wash the area immediately and as often as you would like. A cooling gel like Ocean Potion or Aloe vera gel ( stored in the refrigerator for best results) is very soothing for the 1st few days. Wound care may require gently washing the area with soap and water or hydrogen peroxide 2-3 times a day and applying an over the counter antibiotic ointment or a non-irritating moisturizer like Purpose, Cetaphil or Aquaphor to the area. Avoidance of harsh or abrasive cleansers are advised. Picking or scrubbing the skin could cause in severe irritation or scarring. Mild to moderate redness and or swelling is not uncommon the 1st day or two after PDT and can be lessened by use of an ice bag, ice cubes or chips in a small Ziplock baggie, or frozen peas in their bag. Applying cool packs or ice use every 5-15 minutes every hour for the first 8-24 hours after your procedure may be very soothing. Swelling may be more common for procedures around the eyes or lips. Sleeping propped up on a few pillows or in a reclining chair may help decrease swelling after treatment of the head and face area. Your physician should be notified of any infections, cold sore outbreaks, extreme swelling, or other unexpected reactions. Rarely, a visit to the physician’s office may be necessary for severe swelling or infection. Oral antibiotics, cortisone creams or pills, or other medications may be required for adverse reactions. Your physician will need to know if pain is increasing after 1-2 days after your procedure or if you are having fever or other concerning symptoms. In such cases, you may need to be seen at the physician’s office. Most patients are advised to try to avoid applying makeup or powder directly on a fresh or open wound unless the surface is fully healed. Makeup or other cover-up is generally tolerated starting on the 1st or later dates after PDT. A non-irritating sunscreen such as zinc or titanium may be applied immediately after the procedure before leaving the physician’s office. Sunscreens are ideally also applied twice a day after PDT. •What is the chance that my pre-cancers will recur? While PDT is a very effective treatment, there is a reasonable chance that you may l continue to need periodic treatments for pre cancers depending on your individual sin and severity of prior sun damage. Often there are layers of underlying sun damage from prior years that rise to the surface over time. Photodynamic Therapy clearance rates have been reported as high as 60-90% with even one treatment. Additional treatments are advisable for patients with multiple lesions or hard to clear areas. It is important to understand that very few treatments or surgeries have a 100% cure rate. A skin pre-cancer or cancer may recur or a new cancer may arise in the same or adjacent area even after Photodynamic Therapy or other treatments. Some skin pre- cancers are more aggressive than others and need additional treatment and closer follow up. Skin sun damaged skin frequently needs additional follow up and possible further treatment, at least annual rechecks and possible touch up PDT treatments are advised. Several studies have shown that Photodynamic Therapy tends to have a cure rate comparable to the gold standard treatment with Efudex ( fluorouracil). It is important to note that PDT may not be necessarily curative in advanced skin cancer (rare cases) and may need one or more procedures such as biopsy, surgery, radiation or other procedures to fully treat the lesion. Good follow up appointments with your dermatologist or physician are very important, especially in the first few years after Photodynamic Therapy. Many patients are seen every 4-6 months after their diagnosis of a skin pre-cancers. Self skin examinations monthly are good practice for patients with a history of skin cancer. Any changing or new growth should be promptly checked by your physician. More regular follow up appointments may be needed for those with more aggressive tumors or tumors in high risk areas. There are many good and effective ways to treat skin cancers. Depending on the type and location, options may include Mohs surgery, local radiation (X-ray) treatments, curettage and desiccation “C&D” ( scrape and burn), cryosurgery ( specialized deep freezing), photodynamic therapy, regular surgical excision, plastic surgery treatment, interferon injections, laser removal and surgery, and several prescription creams including Aldara ( imiquimod) and Efudex ( fluorouracil).